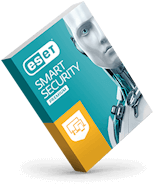 ESET Threat Intelligence data feeds utilize widely supported STIX and TAXII formats, which makes it easy to integrate with existing SIEM tools. Integration helps to deliver the latest information on the threat landscape to predict and prevent threats before they strike. 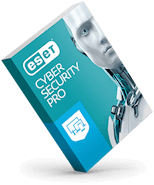 ESET Threat Intelligence features a full API that is available for automation of reports, YARA rules and other functionalities to allow for integration with other systems used within organizations. These allow organizations to set up custom rules to obtain company-specific information that security engineers are interested in. Organizations receive valuable details such as the number of times specific threats have been seen worldwide, URLs containing malicious code, malware behavior on the system, where it was detected, and more. ESET Threat Intelligence proactively notifies security teams of the most recent targeted attacks and command and control (C&C) servers that have occurred elsewhere. 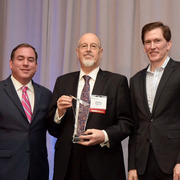 Threat intelligence provides TAXII feeds which can be connected to UTM devices to stop connectivity to or from malicious actors, thus preventing data leaks or damages. Businesses input rules and mitigations to prevent the intrusion of malware into their organizations. 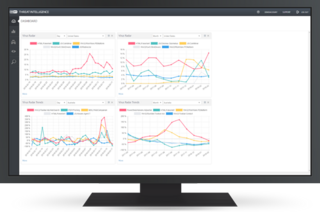 Keeps the user informed about a potential attack that is under preparation or an ongoing attack aimed specifically against their organization. This report includes YARA rule strings, reputation information, similar binaries, file details, sandbox output and more. Delivers regular and quantitative data about identified malware families and variants of botnet malware. The report provides actionable data that includes Command and Control (C&C) servers involved in botnet management, samples of botnets, global weekly statistics and a list of targets of this malware. 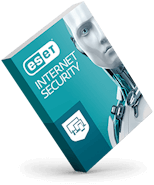 Generated when ESET detects a newly released SSL certificate by a certificate authority which has a very similar asset as the one provided by the customer during initial setup. This may include details such as upcoming phishing campaigns that are attempting to leverage this certificate. The report provides key attributes of the certificate, YARA matches and certificate data. Shows data about all phishing email activities targeted for the selected organization. The report provides phishing campaign information including campaign size, number of clients, URL screenshots, preview of phishing email, location of servers and much more. 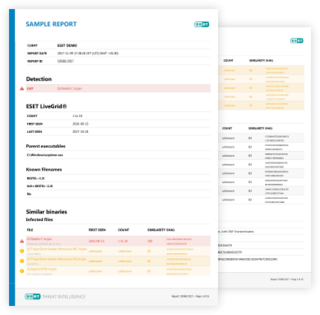 Creates a custom report based on the submitted file or hash, which provides valuable information for fact-based decisions and incident investigations. Features domains which are considered malicious including domain name, IP address, detection of file downloaded from URL and detection of file which was trying to access the URL. Features executables which are considered malicious and recognizes and shares information such as SHA1, MD5, SHA256, detection, size and file format. Features three types of feeds that check more than 1,000+ targets per day including information on the botnet itself, servers involved and their targets. Data provided include items such as detection, hash, last alive, files downloaded, IP addresses, protocols and targets.